When Sister Mary Diana, 83, of Springfield, Oregon, became a consecrated hermit almost 40 years ago, she was among the first in the US. “There were some, but not like what you’ve got now,” said Sister Mary Diana, who lives with Sister Mary Magdalene, 89, who was also among the country’s first hermits. If the ease with which hermits and hermitages can be found on the Internet is any indication, more and more people are discerning the call to a life of prayer and solitude with God. One reason for an increase in the hermitic life is the fact that when Canon 603 was promulgated in 1984, it allowed bishops to accept within their own dioceses hermits who were not affiliated with religious orders. Canon law allows men and women like Maria, who is now in her 60s and who spent the better part of her adult life raising children, the opportunity to discern whether they have a call to the hermitic life. It was disappointing to Maria to learn that most Catholic women’s religious orders would not accept her because of her age. Becoming a hermit, however, will give her the chance to partake in the religious life. Sister Mary Diana agreed that some may be turning to the hermitic life because of the culture’s moral decay. “You cannot do anything politically because the cards are stacked against you,” she said, but added that prayer, on the other hand, is always a good option, because it is always successful. Is the hermitic life lonely? Although it would be easy to imagine the hermitic life as a lonely one, Sister Mary Diana cheerfully dispels that idea. “How could you ever get lonely in the Lord’s presence?” she asks. The sisters, who attend a Byzantine Catholic parish, have no structured schedule at all—which is a common feature of Eastern Catholic hermits—but pray and stay close to the Lord at all times. The Lord, however, brings people to them, according to Sister Mary Diana. She described one day in which she and Sister Mary Magdalene had a strong desire to pray. Soon after they began praying, a man showed up at the door and became part of their prayer. This person was going through a difficult time, so the sisters stopped what they were doing and ministered to him. 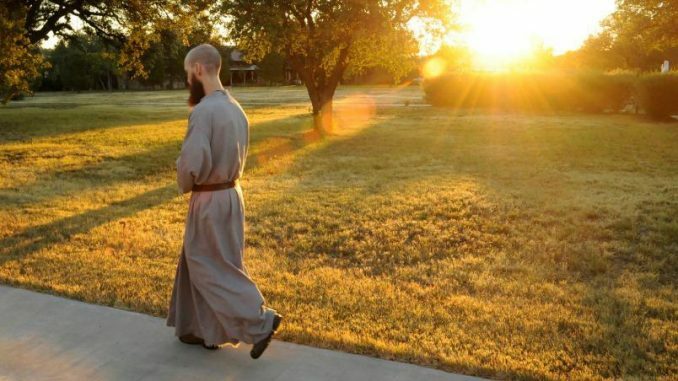 Brother Martin, of the Hermits of the Blessed Virgin Mary of Mount Carmel in Christoval, Texas, said that although he does get lonely sometimes, “There are probably people in cities who rub elbows with people every day, and they are intensely lonely.” He added that being in a location where God is placed first and the fact that he has hermit brothers around keep things from being completely solitary. The brothers have become like a family to him. In living the life of a hermit, Brother Martin said he imitates Christ. “In the hermitic life one retreats from the world, much like Christ did when he went off for 40 days in the desert to pray or when he went to lonely places to pray,” he said. In many ways, the hermitage sounds similar to a traditional religious monastery. The difference, however, is that in a hermitage, the hermits live in separate dwellings, and pray some of their prayers privately. To support themselves, the brother hermits make different kinds of bread, as well as jellies, apple butter, and chocolate fudge. The hermit brothers take the money and divide it by 12—that is their yearly budget. People also donate, and help with the construction of the hermitage. People buy the hermits’ wares from their website, through the catalog the hermit monks produce, or at the hermitage gift shop. Some of the hermits go to a particular location to sell wares. The hermits must stick to a strict schedule, and, according to Brother Martin Mary, it is physically demanding. The hermits rise at 3:30 am each day, and when they are not using that time to pray, they are taking care of the large hermitage, gardening, caring for the goats and chickens, tending the grounds, and digging ditches. There is time allotted for a siesta during the day, but he said that many times they do not end up getting around to it. Bedtime for the hermits is 8:30 pm, if the work for the day has been completed. Brother Martin Mary said what visitors find most surprising about life in the hermitage is the schedule. He said it brings a lot of peace to him and the other brothers. “We’re happy and we are fulfilled [through] surrendering of self-will and obedience,” he explained. When it comes to technology, Brother Martin and the other hermits, like Sisters Mary Diana and Mary Magdalene, have no access to radio, TV, or newspapers. However, since the brothers sell their homemade goods online, they must have access the Internet in order to maintain the website and keep up with sales. During those moments, a hermit brother is not allowed to access the Internet himself, but must do it with his superior present or in union with everyone else. “That way, we don’t get into any trouble,” said Brother Martin Mary. The brothers’ superior keeps abreast of current events, and informs the other hermit monks of any life-threatening weather situations or major news events. For example, on 9/11 Brother Martin Mary’s superior showed him and the other hermit monks pictures of what occurred on the computer. Maria, who has not taken any private or public vows, still has access to a cell phone and the Internet, but may have to give those up at some point if she decides to pursue the hermitic life. Prior to becoming a hermit, Sister Mary Diana was a cloistered Dominican nun for 20 years, which she describes as a beautiful vocation. Like Mother Teresa, though, she says she experienced a “call within a call,” in which she discerned she was being called to life as a hermit. “A seed was planted when I was in the monastery,” she said. Brother Martin Mary was raised Catholic, going to Mass on Sundays. When he went to college, however, he quit going to Mass. Through the influence and intercession of his mother, who had left the faith and then returned herself, he started practicing his faith again. When he made the decision to become a hermit, he met some resistance from his family. “I am an only child, and to think about a celibate vocation cancels out grandchildren for my parents—that was already hard enough to take,” said Brother Martin Mary. He said it was also hard for his mom to give him up. He said the fact that his mom was such a woman of prayer, she was able to overcome that. His father did as well, eventually. In 1996, Maria started saying the Divine Office, and the more she said the Office, the more she started to hunger for a religious order. “I approached a number of them, and I was told I was too old,” she said. Maria also had several impediments, though: a minor child, duties to family, and student loan debt. “I joined an email list in order to find out about vocations for older women,” she said. She was reading posts about religious orders when she came across a post in which someone identified himself as “semi-hermitical.” She did not know what that meant, so she contacted the author of the post, who turned out to be a superior over hermit monks. His order had no corresponding women’s order. “It was kind of an eye-opener, that such a life existed,” she said. From there, she went on a quest, reading everything she could about hermits. As soon as her impediments were taken care of, she sought an orthodox spiritual director. How does one know he or she is on the right path? Maria said for her, it was after years of study, years of saying the Divine Office, and spiritual direction. If you think you may have a calling to the hermitic life, Maria said, “Don’t give up. Read everything you can.” She said books such as Poustinia by Catherine Doherty and the early works of Thomas Merton have really helped her in the discernment process. “My goal is to discern, step by step with my spiritual director, what God wants,” said Maria.